Even the very thought of Christmas makes me smile. While writing this I am imagining a plate full of colorful Christmas cookies, sparkling Christmas tree and warm home atmosphere with my family. What do you need to make this Christmas Sugar Cookies with Cream Cheese Frosting? I enjoy decorating my home and Christmas tree, holiday shopping and preparing gifts. I love holiday euphoria. On Christmas Eve we try out Christmas cookies. 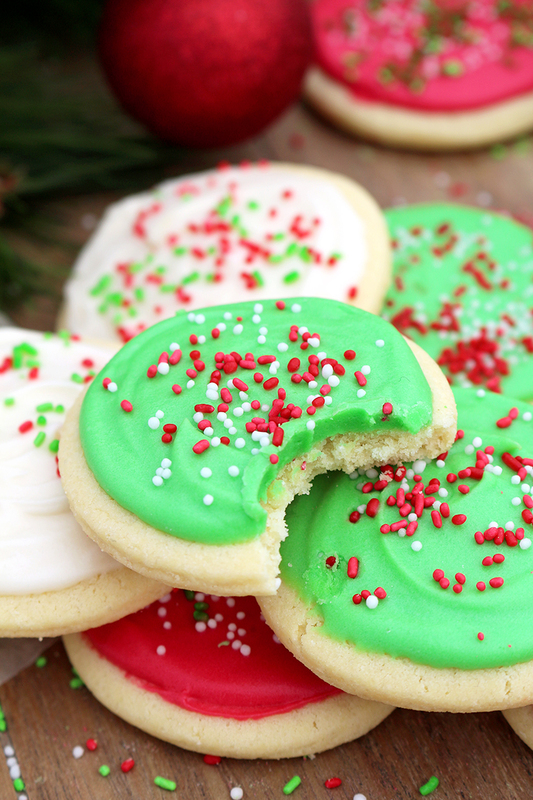 How to make this Christmas Sugar Cookies? TO PREPARE COOKIES: Preheat the oven to 350 F. Line two baking sheets and set aside. In a large dish combine flour, cornstarch, salt and baking powder. Set aside. In a separate dish put butter and sugar and mix well using electric mixer, medium speed, until it gets light and fluffy. Add an egg and vanilla and mix until combined. Continue mixing slowly adding dry ingredients. The dough will be crumbly. Knead it well with your hands. Put some flour on the table and place the dough on it. Roll the dough up to ¼ inch thick. Cut it in round shapes. I used a glass 2.4 inch in diameter. Place the cookies in the baking sheets. They should be 2 inches apart. Put them in the oven and bake for 8-9 min. Take them out of the oven and leave to cool for a couple of minutes on the baking sheets. Transfer them to a wire rack to cool completely. TO MAKE THE FROSTING: In medium dish mix butter, cream cheese and vanilla, with a hand mixer, medium speed. Add powdered sugar and mix until well combined. Divide the mixture into 3 bowls. Add red food color in the first one, slowly, until you get the shade that you like. Put green in the second bowl, and leave the third one white. Spread the filling evenly on the cooled cookies and sprinkle with crumbs. They are easy to prepare and they simply melt in your mouth. I especially like decorating them, that‘s my favorite part. Here are some more suggestions how to sweeten your Christmas and decorate your dinner table with a plate full of various cookies. For chocolate fans, I suggest Double Chocolate Cheesecake Cookies and Christmas Chocolate Crinkle Cookies. If you prefer truffles, check out Peanut Butter Chocolate Acorn Truffles and Caramel Pecan Truffles. Cookies that are decorated in the Christmas spirit would be Holiday Maraschino Cherry Shortbread Cookies and Holiday Red Velvet Kiss Cookies. Sweet, sweeter, the sweetest sugar cookies have already been tried out. We are waiting for Christmas to prepare them again. I can hardly wait… Put them in a nicely decorated box and they will be a present for your loved ones. Merry Christmas! Christmas Sugar Cookies with Cream Cheese Frosting are perfect for the upcoming holiday - Christmas, especially for those who like sugar cookies on their Christmas plates. Preheat the oven to 350F. Line two baking sheets and set aside. In a large dish combine flour, cornstarch, salt and baking powder. Set aside. In a separate dish put butter and sugar and mix well using electric mixer, medium speed, until it gets light and fluffy. Add an egg and vanilla and mix until combined. Continue mixing slowly adding dry ingredients. The dough will be crumbly. Knead it well with your hands. Put some flour on the table and place the dough on it. Roll the dough up to ¼ inch thick. Cut it in round shapes. I used a glass 2.4 inch in diameter. Place the cookies in the baking sheets. They should be 2 inches apart. Put them in the oven and bake for 8-9 min. Take them out of the oven and leave to cool for a couple of minutes on the baking sheets. Transfer them to a wire rack to cool completely. In medium dish mix butter, cream cheese and vanilla, with a hand mixer, medium speed. Add powdered sugar and mix until well combined. Divide the mixture into 3 bowls. Add red food color in the first one, slowly, until you get the shade that you like. Put green in the second bowl, and leave the third one white. Spread the filling evenly on the cooled cookies and sprinkle with crumbs. Store in a well sealed container. 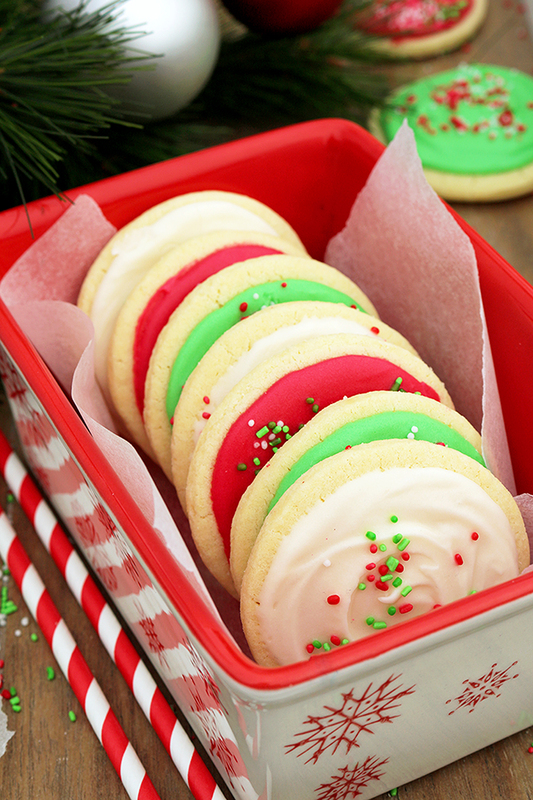 Hi- just wondering if the icing gets hard enough that the cookies can be stacked on top of each other (in order to put them in containers as gifts)? I don’t think that would be a good idea. You can try to put cookies in container like in our pictures. Can this cookie dough be made in advance and stored in the freezer? Hi! Are these crisp or soft sugar cookies? Cream cheese frosting gives them soft texture. How would you describe the texture of the cookie, soft , chewy? Oh my goodness fabulous cookies. You go girl. It makes a lot of cookies. I love them. Will post a picture of them on Pinterest. Thank you for the wonderful Christmas recipe: oh I love love LOVE the icing. How long are they good for? I want to make some in advance but I want them to taste ‘fresh’. Looking forward trying out the recipe! Greetings from Austria! You can store them in a well sealed container to keep the freshness, up to 3-4 days. Hi, just a thought, why not make the cookies and ice them, put them on a tray and freeze. Then they can be stacked in freezer bags and given as gifts? Great idea? This way they can be made ahead and will still taste fresh. you can keep cookies in a well-sealed container and freeze them, but I’m not sure about cream cheese frosting. I love the cream cheese frosting on these. Yum!